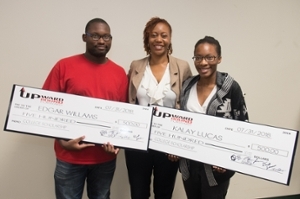 For six Southern Illinois University Edwardsville East St. Louis Center Upward Bound (UB) East St. Louis and Cahokia (EC) program alumni, their means of “paying it forward” involves cashing in on past opportunities afforded to them. Donating a scholarship of $500 each to Kalay Lucas and Edgar Williams were UB alumni Eric Cooper, Brandon Jackson, Donnell Johnson, Donald Roberson, Jeremy Sanders and Craig Slaughter. Cooper, Jackson, Roberson and Sanders made the presentation to the recently graduated UB students on Tuesday, July 31 at the SIUE East St. Louis Center. Lucas, who will be a freshman at Central State University in Wilberforce, Ohio, plans to major in computer science. Williams, who will be a freshman at Harris-Stowe State University in St. Louis, plans to major in computer science. According to Cooper, because Upward Bound helped him and his friends not only visualize a college education, but take the steps to enroll and complete their post-secondary education, the men wanted to assist other young people in obtaining a college degree. Cooper said that he and his friends plan to award scholarships annually to selected ESLC Upward Bound graduates. “This is a great example of showing the success of the Upward Bound Program, and how it helps students to achieve, be a positive force in the community and to give back to those who are coming behind them,” said Upward Bound Program Director Keith J. Ware, EdD. The SIUE Upward Bound EC/BEM program helps youth prepare for higher education and serves students from East St. Louis and Cahokia (EC), and Brooklyn, East St. Louis Charter and Madison (BEM), High Schools. Participants receive instruction in literature, composition and STEM subjects on college campuses after school, on Saturdays and during the summer. The quality services provided will prepare the students for successful high school completion and entrance into post-secondary programs. Upward Bound is a college-preparatory program designed to serve low-income and/or potential first-generation college students who are currently in grades 9-12. Receiving their scholarship money are Edgar Williams (left) and Kalay Lucas (right). Congratulating them from left to right are Upward Bound Program Director Keith J. Ware, EdD; Eric Cooper, Donald Roberson III, Brandon Jackson and Jeremy Sanders, all UB alumni; UB Program Coordinator Barbra Sams; and UB Counselor Gary W. Traylor Sr. Receiving congratulations from East St. Louis Mayor Emeka Jackson-Hicks (center) are Edgar Williams, left, and Kalay Lucas.